Throughout this report, the analysis of partisan attitudes combines both those who identify with and those who lean toward the parties. In many respects, those who lean toward the parties—even if they identify as independent—have attitudes and behaviors that are very similar to those of partisans. That most leaners are “closet partisans” has been observed by many political scientists (see here and here for a few recent examples of this discussion). And we have remarked on this in prior Pew Research Center studies, including in our 2012 Values poll—see the end of section one of the Values report for a discussion. And this pattern is again evident when it comes to the two dimensions of polarization discussed in this report: ideological consistency and partisan acrimony. On the first, discussed here, leaners’ ideological positions largely overlap those of partisans. And as Republicans have become more conservative, and Democrats more liberal, leaners have moved along with them. Over the last two decades, Republican leaners have been, on average, just slightly less conservative than Republicans overall. 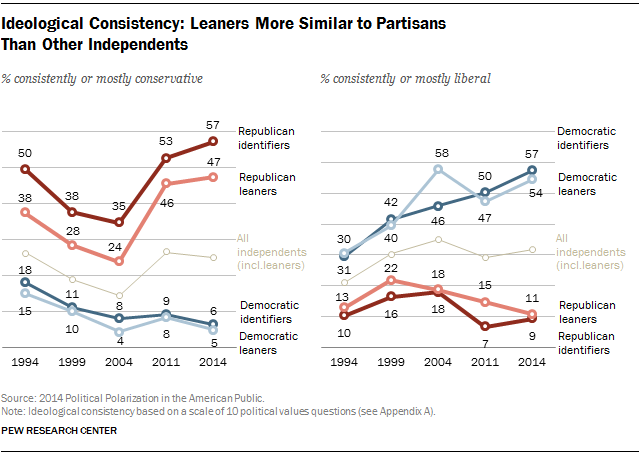 For instance, today, 57% of Republican identifiers and 47% of Republican leaners are consistently or mostly conservative. 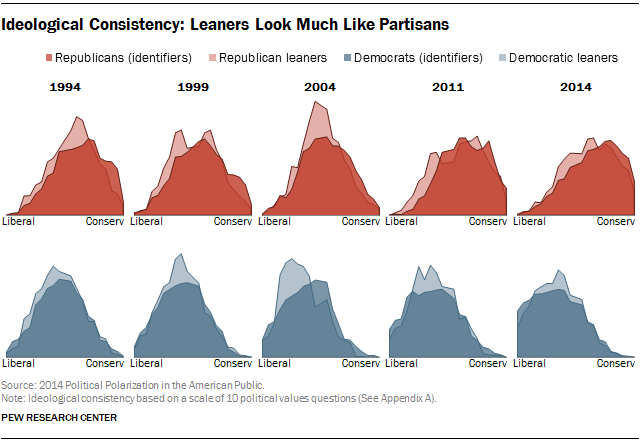 By contrast, just 5% of Democratic leaners are mostly or consistently conservative (see Appendix A for a discussion of the ideological consistency scale). The positions of those who identify as Democrats and those who lean toward the Democratic Party are nearly identical over this time period: 57% of Democrats and 54% of Democratic leaners are consistently or mostly liberal today. When the two groups did diverge in 2004, Democratic leaners were somewhat more likely than Democrats to be to the left of center. And the dislike of the opposing party discussed here is almost as acute among leaners as partisans. Today, nearly as many Republican leaners (40%) as Republicans (46%) express very unfavorable opinions of the Democratic Party, and the steep growth in deeply negative views is seen in both groups. On the left, Democratic leaners are somewhat less likely than Democratic identifiers to hold strongly negative views of Republicans (42% of Democrats and 30% of Democratic leaners have a very unfavorable opinion of the GOP). 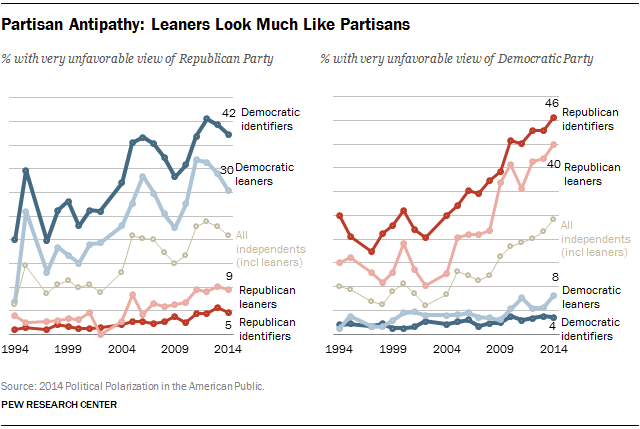 Still, the overall growth in antipathy is just as pronounced among leaners as among Democrats. Overall, it would have been possible to combine these two groups of “leaners” into a single “independent” category to contrast with Republicans and Democrats (that line is plotted in the middle of the above graphics). But combining these two dramatically different groups would be misleading; these are two groups that have little in common with each other, and far more in common with self-identified partisans.